Mission Statement Trinity School creates a community of learners in a diverse and distinctly elementary-only environment, in which each child develops the knowledge, skills, and character to achieve his or her unique potential as a responsible, productive, and compassionate member of the School and greater community. Non-Discriminatory Statement Trinity School does not discriminate based on race, color, gender, religion or creed, national or ethnic origin, sexual orientation, or family composition in the administration of our admission and educational policies, in the extension of financial assistance, or other schooladministered programs. Trinity School Wins 2019 Top Workplace Award Trinity has been recognized as a Top Workplace by The Atlanta Journal-Constitution. Faculty and Staﬀ Milestones Enjoy this new section that celebrates the personal milestones of our faculty and staﬀ. Trinity Tidbits Read highlights from the fall at Trinity and learn about the expertise of our faculty and staﬀ as they lead professional development around the country. Trinity Traditions Take a peek at the recent traditions that reinforce Trinity’s identity, curriculum, and values. A musical path to better language acquisition and literacy skills Explore the rich connection between music and improved literacy skills. Exploring science at Trinity Trinity’s science program instills confidence and a sense of wonder in our students. Pantry Pals: Empowering the young service learner Students and teachers discover the true meaning of service learning. Leading learners to level up Learning progressions provide diﬀerent pathways for students to reach or surpass their learning targets. Lights, camera, action! The spotlight is put on TTV, a highlight of the Sixth Grade leadership year. Spotlight on Art 2019 Celebrate with us as we look back at Spotlight on Art throughout the 2018–19 school year. The ABCs of self-regulation Learn about how to help children develop the self-regulation skills they need to flourish. Young alums have passion for service work Age is not a factor for three alums who have a passion for serving others and making a diﬀerence in the world. Coding: It’s not child’s play Coding Blue-Bots helps students uncover rich mathematics and provides context for the standards for mathematical practice. Flexible seating empowers students Flexible seating allows students to be more in control of their educational environment so that they maximize their learning ability. Alumni Events Alumni events throughout the 2018–19 school year are featured in this fun spread. Art Director and Design Cheryl Beverly, Ridge Creative, Inc.
Head of School Joe Marshall, Upper Elementary Division Head Sarah Barton Thomas, Early Elementary Division Head Rhonda Mitchell, and Stripes the Tiger teach the entire school a new dance at a Trinity Together Time. when they participated in them. These traditions are important rites of passage and help students develop self-confidence as well as a sense of community belonging. In addition to the countless traditions so meaningful to our students and their parents, our faculty are eager to implement new ideas into classroom projects, activities, and teaching methods. Trinity TV, a.k.a. TTV, has become a hallmark of the Sixth Grade year, and service learning throughout the school helps our students understand individual and collective responsibility in improving our local, national, and international communities. Youâ&#x20AC;&#x2122;ll also read how learning progressions provide students a scaffolding to facilitate both deep learning and self-reflection and assessment. First Grade Lead Teacher Julianne Schaaf â&#x20AC;&#x2122;81 taps out sounds during a dictation exercise with her students Shan, Jackson, Ansley, and Clara. Sixth Grade Language Arts Teacher Kailynn Boomer, STEAM Integration Specialist Kate Burton, and Pre-K Assistant Teacher Kimberly Martin mingle during the Back-to-School Night Diversity Mixer. Sixth Grader Brooks and Fifth Grader Charlie enjoy the after-school Computer Construction class led by Help Desk Support Technician and Extended Programs Teacher D’Marr Sewell. Faculty and Staff Milestones Join us as we celebrate the personal milestones of Trinity School’s faculty and staff in this new feature. Fourth Grade Lead Teacher Grace Akbari married college sweetheart Austin Akbari on June 30, 2018, at Woodmont Christian Church in Nashville, Tennessee, with a reception following at the Parthenon. The couple then spent their honeymoon in Turks and Caicos Islands. Second Grade Lead Teacher Sarah Hanzman and her husband, Jami, welcomed Olivia Charlotte Hanzman on November 1, 2018. She joins proud big brother Jack. First Grade Lead Teacher Christina Tankersley and her husband, Lake, welcomed their first child, William Lake Tankersley, on April 16, 2018. Fourth Grade Lead Teacher Brian Toth married Samantha Bell at Meadow Wood Manor in Randolph, New Jersey, on May 25, 2018. The newlyweds then spent half of their honeymoon at Walt Disney World and the other half in Belize. Director of Extended Programs Kayleen Whitmer, her husband, Mark, and their son, Rowan, welcomed Kai Falco and angel baby Julian John on February 7, 2018. Fourth Grade Lead Teacher Meggan Hester and her husband, Jaime, welcomed their first child, Owen Hugh Hester, on June 27, 2018. Security Officer Justin Jackson and his wife, Joy, welcomed their first child, Jonas Russell Jackson, on December 19, 2018. Fifth Grade Lead Teacher Laura McRae and her husband, Douglas, welcomed Lucy Walker McRae on August 24, 2018. She joins proud big brother Wales. Pre-K Assistant Teacher Kelly Williams and her husband, Rusty, welcomed Caroline Kelly Williams on August 17, 2018. She joins proud big sister Catherine. Highlights Trinity Tidbits Dreambox Learning takes off At the beginning of the school year, Trinity School introduced DreamBox Learning, an adaptive K-8 digital math program. This resource has been positively received by students, teachers, and parents. Dreambox supplements our nationally normed math curriculum, and Trinity Teachers use it to provide rich visuals and interactive support to deepen conceptual understanding. The program provides our students with opportunities to strengthen mathematical fluency and play with mathematical concepts and ideas. The adaptive response within DreamBox provides a learning environment that is just right for children in challenging them and providing appropriate practice. Blooper stops by On September 4, Blooper made a special visit to Trinity School. Stopping by the second assembly of the school year, the Atlanta Braves mascot put on a show with Stripes the Tiger, mingled with Trinity students, and then went on a tour of the School with Trinityâ&#x20AC;&#x2122;s mascot. Stripes takes Blooper on a tour of Trinity. Dr. Reis presents at CHOA In October, Dr. Carli Reis, Trinity’s Consulting Psychologist since 2015, presented “Disruptive Behaviors in Young Children” at Children’s Healthcare of Atlanta to a group of primary-care pediatricians as part of their Continuing Medical Education (CME). Gough leads sponsored webinar At Trinity since 2012, Director of Teaching and Learning Jill Gough co-led a webinar, “Implementing Tasks That Promote Reasoning and Problem Solving,” in October for Sixth–Twelfth Grade Math and Science Teachers that was sponsored by Texas Instruments. Burton leads science seminar On October 12, STEAM Integration Specialist Kate Burton presented “Science for Service Learning Success” at a National Science Teachers Association area conference held in Reno, Nevada. She has been at Trinity since 2012. FBI Ambassador Haley visits Quantico On October 23 and 24, Director of Operations Reginald Haley visited Washington, DC, with his FBI Citizens Academy alumni group to tour FBI headquarters and attend informational sessions. Haley and his fellow FBI ambassadors also spent a full day at the Marine Corps Base in Quantico, Virginia, home to the FBI Academy. They received a firsthand look at cadet training, the arms range, and forensics, and they participated in a Q&A session with local agents after touring the facilities. Haley is pictured with fellow FBI ambassadors, including Trinity parent and Trustee Farrah Spainhour, at the entrance to the FBI Academy in Quantico, Virginia. Trinity welcomes award-winning author At the end of October, award-winning author Jack Gantos visited Trinity School to speak to students about his books and writing, present teacher writing workshops, and lead a Trinity Together Time. Gantos is the recipient of the prestigious Newbery Award for his novel Dead End in Norvelt. He is also the author of the Rotten Ralph series for younger children and chapter books for older children. Gantos chats with Fourth Graders after his presentation. Navsaria uses the book Where the Wild Things Are in his presentation on early childhood literacy. Cahill leads P.E. professional development Trinity P.E. Teacher Justin Cahill, a 12-year veteran faculty member, led two professional development sessions at the 81st annual New York State Association for Health, Physical Education, Recreation and Dance Conference held November 15–18 in Verona, New York. Cahill, who manages an online community focused on “Keeping Kids in Motion,” presented Instant Activities—exploring a wide range of ways to get students moving as soon as they enter the gym—and Keeping Kids in Motion by Keeping Fitness Fun!—providing fun, dynamic, and challenging ways to keep kids moving throughout their P.E. class as well as throughout the day. In addition, he served as a guest judge for an event called “Mission Impossible,” in which four teams were assigned an arbitrary grouping of equipment and had 10 minutes to prepare a two-minute presentation on an activity using all of the equipment. Holden enlightens peers on air and at GAEYC Early Education Math Specialist Becky Holden, who joined the Trinity faculty in 2015, led a class on “Mathematizing Our Read-Alouds” at the Georgia Association for the Education of Young Children (GAEYC) annual conference held in Alpharetta, Georgia, on October 5 and 6. Her presentation focused on how young students come to understand numbers by having numerous experiences with them and how context, through literature, lets them know what numbers represent and how they relate to each other. In December, Holden was featured on “The 10-Minute Teacher Show,” a five-day-a-week podcast hosted by educator and author Vicki Davis, creator of Cool Cat Teacher blog. Holden discussed best practices in formative assessment in Kindergarten, from notetaking on how knowledge is forming as students are learning to the importance of understanding a child’s learning path. New flexible furniture in the MPR Thanks to the generosity of the Trinity School Parents’ Association, the School’s Multi-Purpose Room was outfitted with flexible new furniture during the summer of 2018. Students and teachers alike enjoy using the comfortable seating and tables that provide all learners with the ability to configure different learning spaces as they converse, collaborate, and create as well as spread out for individual work. Sixth Graders enjoy utilizing the new furniture in the Multi-Purpose Room as they determine what values are important to them as a leader during Values class. Gangarosa celebrates 12 years of the Georgia Youth Choir Second–Fourth Grade Music Teacher Alyssa Gangarosa co-founded the prestigious Georgia Youth Choir in 2007, the same year she began teaching at Trinity. Under her artistic direction, this highly selective group has around 70 members each year and includes numerous Trinity students. Over the last nine years, the Georgia Youth Choir has been the exclusive choir for all performances of the Atlanta Ballet’s Nutcracker, held at the Fox Theatre in Atlanta. In addition, the Choir has performed in two major motion pictures; on various television shows; with the Atlanta Symphony Orchestra; and for Children’s Healthcare of Atlanta, the Atlanta Hawks, the Harlem Globetrotters, CNN, and other major companies and media organizations. A frequent guest conductor/clinician for choirs, choral festivals, and workshops across the United States, Gangarosa previously served as Assistant Director of both the Indianapolis Children’s Choir and the Columbus Indiana Children’s Choir. For 10 years, she also served as choral director for the annual Junior Academy of Music at the University of Michigan-Flint. A certified Kodály instructor, Gangarosa is past president of the Indiana Kodály Educators and a founding board member of the Kodály Educators of Georgia. She is a member of the American Choral Directors Association, American Eurhythmics Society, and the Organization of American Kodály Educators (OAKE), for whom she has written numerous reviews of choral literature for their national scholarly publication, The Envoy. Gangarosa earned a Master of Music in Education from Florida State University and a Bachelor of Music Education from Augusta State University. Trinity Choir brings holiday cheer The Trinity Choir, comprised of Third through Sixth Grade students, was featured at Post Riverside’s First Annual Holiday Lighting Event on Friday, November 16. Free and open to the public, the event featured a DJ, balloons, face painting, artists, vendors, games, gift card giveaways, and other fun activities that led up to the Trinity Choir performance and holiday lights being turned on. The Trinity Choir performs during the Holiday Lighting Event at Post Riverside. Rowan is pictured with his grandparents, Devaki and Promod Jossy, who encouraged him to submit his story to The Rising Nepal. Stewart presents at social studies conference At Trinity since 2012, Sixth Grade Social Studies Teacher Javonne Stewart presented “Taking a Stance: Teaching Perspective and Civic Engagement Through Classroom Debates” at the Georgia Council for the Social Studies annual state conference held in Athens, Georgia, on October 11 and 12. Trinity School Summer Camp offers a variety of academic, specialty, and sports camps— including Coach Brian Balocki’s popular Atlanta Sports Camps—for children ages 4 to 13. Choose your child’s summer adventure from our camps that will run Monday–Friday from June 3–28 with limited offerings available from July 29–August 2. Please contact Kayleen Whitmer, Director of Extended Programs, at kwhitmer@trinityatl.org for more information. Trinity Traditions Trinity School’s rich history began in 1951. While the campus has moved twice since its founding and the School’s programming is enhanced every year, Trinity also maintains numerous gradelevel, division-wide, and school-wide traditions that reinforce the School’s identity, curriculum, and values. This section is dedicated to highlighting some of the many special events that our students look forward to every year. First Day of School The first day of school is important for all students, but there is something special about the Sixth Graders’ carpool caravan. Catching the Gingerbread Man At the beginning of the school year, Pre-K students once again found the runaway Gingerbread Man while becoming acquainted with all of the faces and places at Trinity. Pirates Week In September, Early Learners wrapped up Pirates Week and their Shapes unit of study with a real-life treasure hunt! Nursery Rhyme Parade In September, Pre-K students dressed up as their favorite characters and recited nursery rhymes during the Nursery Rhyme Parade. Fun Run/Walk In October, faculty, staff, students, and their families ran with Tiger pride during the 15th annual Trinity Fun Run/Walk. Fall Festival Trinity’s campus was transformed during the School’s annual, fun-filled Fall Festival. Grand Day In the fall, students enjoyed having their grandparents or special friends on campus for a welcome reception and time in the classrooms. Halloween Parade Early Elementary Division students and faculty donned fantastic costumes and put the Trinity community in the Halloween mood by throwing the annual Halloween Parade. Patriotic Performance To honor Veterans Day, Fourth Grade teachers and students invited friends and family members who serve or previously served in the military to join them for a special Patriotic Performance during Trinity Together Time (TTT). Thanksgiving Program All of the grades came together and celebrated the Thanksgiving season during a special time of musical performances. Native American Trade Day At the annual Trade Day, Second Graders celebrated the end of their Native American unit by coming together and representing various tribes to solve a common problem. The Nutcracker Hosted and performed every year by Fifth Graders, the muchanticipated annual performances of The Nutcracker were set to Tchaikovsky’s classic score and included singing, dancing, elaborate costumes and set design, and epic battles. Christmas Holiday Program The Upper Elementary Division students put everyone in the holiday mood by presenting a special musical performance at Trinity Presbyterian Church. All traditions occurred during the first half of the 2018–19 school year. Features Engine, Engine Number Nine, Going down Chicago Line If the train should jump the track, Do I get my money back? Yes, no, maybe so! EED Music Specialist Phyllis Sommer leads Pre-K students Emily, Alisha, J.P., and McKinley as they synchronize the steady beat around the gathering drum. Pre-K students McKinley, Jack, Layla, and Carter maintain a steady beat on rhythm sticks while reciting Engine, Engine Number Nine. Pre-K students Vanya, Christopher, Emily, and Chase drum the steady beat on the floor tom-toms. followed for about five years. She and her team in the Auditory Neuroscience Lab research how the brain processes speech and music and, specifically, how musical involvement can build our capacity to turn sound into meaning, a task we take for granted as adults. Pre-K student Alisha places hearts to show division of the beat. Music requires that we make sense of sound. For example, discerning the difference between a cello or a flute playing the same note requires a huge amount of sensory processing and integration. Likewise, the pitch, timing, and timbre of sound all play a role in helping children differentiate one sound from another, like a “b” versus a “p.” In the September 18, 2014, issue of the Journal of Neuroscience, Kraus provides evidence linking the ability to keep a steady beat and the neural encoding of speech sounds. The association between reading and synchronization of the beat were shown to have a common basis in the auditory system. Finally, exposure to the rhythmic patterns that make up music, be it simple chants or more complex songs, is heightened with early music education. “Rhythm is an integral part of both music and language,” Kraus says. “And the rhythm of spoken language is a crucial cue to understanding.” In the EED music classroom, our definition of beat is that it is the “heartbeat of music” and rhythm is “the way the words go.” From Early Learners through First Grade and beyond, Trinity students are keeping the steady beat in a multitude of ways, decoding word rhythms, playing the Orff instruments and recorders, and listening to musical excerpts from the Composer of the Month, seemingly effortlessly. All the while, an ever-strengthening musical path is joyfully building neural connections in their brains that will improve reading and language skills for the rest of their lives! Viva la Música! Exploring science at Trinity Trinity School’s science program instills in students a sense of wonder about the world and cultivates the confidence and skills necessary to seek the answers to their questions. Through an integrated approach, teachers guide students to question, explore, and discover the world around them and to value and apply science in all areas of life. Through an extensive variety of hands-on and trialand-error experiences, each student builds upon and implements scientific process skills while thoroughly exploring engaging content themes. as well as the product of knowledge. Students are naturally curious about the world around them and learn to think critically about how things work. Science lends itself to engaging in characterbuilding activities that empower students to be resilient and persistent while developing empathy for the world around them. Developmentally appropriate playbased learning fosters opportunities for students to collaborate and cooperate while also tackling real-world problems. “Experimenting in science teaches us something new in a fun way because we get to do projects with partners,” says Third Grader Emily. “One of my favorite lessons was when we got to build our own mountain to see how rainfall affected the mountain.” Science is everywhere! It’s in social studies, art, literacy, math, physical education, and on the playground. Our teachers think through the lens of a scientist in their classrooms. They are finding ways to integrate their core subjects and make connections across the disciplines. The newly added STEAM Integration Specialist position is making science even more visible for all learners. STEAM integration is not the only focus of our science curriculum, and we are uncovering science in unexpected content areas. For example, when Kindergartners take a “trip around the world,” they uncover the teachings of Galileo and learn about volcanic eruptions in Italy, they practice the Mayan number system in Mexico, they discover how pigments are combined to produce Aboriginal artwork in Australia, and they study Newton’s work with light and prisms in England. The intentional design of our curriculum provides our students with extraordinary learning experiences that demonstrate how all disciplines are connected. First-Fourth Grade Science Teacher Lauren Kane watches as Third Graders Owen and Lola Gray mine for gemstones during an in-house field trip with Diamond Delâ&#x20AC;&#x2122;s Gem Mining Adventure. Learning outcomes We want all of our students to learn to apply the essential life skills of the scientific process: observing, sorting and classifying, inferring, predicting, experimenting, and communicating their findings. We want them to take risks and be critical thinkers while they investigate the unknown. Our students are innovators, designers, and builders. The biology, chemistry, and engineering skills that they are learning in Trinity classrooms are helping students create unique and innovative solutions to problems that are relevant to them today and providing them with the tools that they will need to find solutions to challenges in the future. Fourth Graders Mary Everett, Modupe, August, Theo, and Harris utilize tools from a classroom science kit to learn about the phases of the moon during their Mystery Science unit. From learning about life cycles and the classification of living things to learning about healthy habits and their changing bodies, students study the core functions of biology and begin to understand how living organisms thrive. Asking questions about gravity, friction, and magnets allow students to formulate how and why things move and change with energy and force. They are not only engaging in hands-on experiments, but also learning to write lab reports to support their findings. Landforms, rocks and minerals, dinosaurs and fossils, weather, and our solar system begin to demonstrate the complexity of our environment and how it has evolved over time. During grade-level science teaming at the Early Learners Science Fair, Dylan, Wanying, and Parker experiment with â&#x20AC;&#x153;snowstorm in a jar.â&#x20AC;? First Grader Myers chats with her pen pal. Pantry Pals: Empowering the young service learner When I set out to help my fellow First Grade team clear a storage closet for a new learning space, I had no idea that the product would be the beginning of a service-learning project that would benefit not only a Title 1 school, but also our First Grade students. Prior to the following experience, I was unclear of the true meaning of “service learning.” I did not understand the difference between it and community service. What I discovered was the mutual benefit, growth, and learning of two schools coming together, incorporating literacy, science, and reflection. During the summer of 2018, a small group of First Grade teachers and I embarked on a mission to create a learning space out of our shared storage closets between the two classrooms. Bins of leveled books, school supplies, and more were removed to convert the crowded space into a cozy “Book Nook.” When the cleanout was complete, the hallway was filled with boxes of books and supplies we were eager to donate, but to whom? First Grader Max meets his pen pal. First Grade families donated supplies to kick-oﬀ the Sawyer Road Elementary School food pantry. A conversation with a family member soon led me to Jessica Strickland, a First Grade teacher at Sawyer Road Elementary School in Cobb County. She and I connected over the summer, and soon, Sawyer Road was the recipient of the 11 boxes of books and school supplies leftover from our closet clean out. We kept in contact, as Jessica reported how thrilled the students and teachers were to have our books and supplies to help fill their classrooms. She also told me that after seeing multiple families without guaranteed meals when they leave school, she and her colleagues set out to clear a classroom and create a food pantry to provide aid to those in need. in healthy non-perishable foods to donate to Pantry Pals. Our students then placed them in boxes organized by food groups. “I looked at the foods that were in the boxes and dropped my food in the ones that matched the food groups,” says First Grader Rebecca. “When we took them to the school [Sawyer Road], I had a can from each box in my bag, so they were going to get healthy food from each food group.” Building their academic foundation, the students connected their background knowledge of the food pyramid to the healthy foods donated to Sawyer Road, and they were able to sort the foods accordingly so that families would have bags containing multiple food groups. First Grader Sierra meets her pen pal. First Graders Thomas, William, Max, and Kavan share a holiday treat with their pen pals. A Sawyer Road Elementary School Fifth Grade Ambassador reads to First Graders Jake and Shan and their pen pals. Grade ambassador to the library, where they were able to listen to stories and get to know each other better. My fellow teachers and I observed smiles, friendly games of arm wrestling, and laughter among these First Graders, despite their various family backgrounds, cultures, and socio-economic statuses. When it was time to go, several of our Trinity students asked, “Do we have to leave?” “When can we write and see our pen pals again?” “Can we please see pictures of the new pantry?” Connections had been established. We boarded the bus back to Trinity with full hearts and big plans for a “next time.” Pen pal letters would surely be written soon. What I learned is that service learning emphasizes mutuality. The students at both Trinity and Sawyer Road benefitted, learned, and grew from this experience. Reflecting on the project, I see that Pantry Pals fostered curiosity, creativity, and confidence as our students adapted to a new situation in their ever-changing world. They wrote, met, and made connections with fellow First Graders from different backgrounds, who attend a different school than their own. It is my hope that Pantry Pals will continue as the First Grade service-learning project as a way to connect with both our curriculum as well as a different school community. Kindergartners Beckett, Henry, and Bailey work together to count the number of poly spots that their group was able to earn during a cooperative throwing game in P.E. achievement in math and literacy than a childâ&#x20AC;&#x2122;s IQ. It is the ability to recognize oneâ&#x20AC;&#x2122;s thoughts and feelings at any given moment, make rational sense of the information, and take appropriate actions. The level at which children execute these critical skills impacts them socially, behaviorally, and academically. The term self-regulation includes a broad set of skills that has been creatively summarized by Sesame Street as the ABCs of Self-Regulation. about a child’s ability to control his or behavior, but the first step to controlling a behavior is recognizing the feelings behind it and having the ability to reframe thoughts and feelings in a way that leads to a productive action. As an example, a feeling of frustration about not winning a game of soccer at recess becomes determination to improve skills through practice rather than angry spitefulness. self-regulation. This is what adults often focus on, because it is the observable outcome of a child’s feelings. This is the child’s ability to practice self-control or delayed gratification in response to the emotions they are feeling, so they are able to follow through with a thoughtful and appropriate reaction. We see an example of this working successfully when a child is able to wait their turn, not blurting out or seeking negative attention with tactics such as silliness. When a child is having difficulty in this area, they may be able to explain the appropriate and expected behavior but regularly act in a way that does not reflect that understanding. opportunities to engage in activities that support self-regulation skill development, and the adults that support them can help by being aware of their importance and providing opportunities for growth. So, how do we help students develop the self-regulation skills they need to flourish? According to Harvard’s Center on the Developing Child, there are three main ways adults help children develop self-regulation. Practice Playing games that require focus, taking turns, and planning help develop selfregulation skills. At home, family board games and card games are great. At Trinity, students develop these skills with teacher coaching while playing games in P.E. ; while playing games like Red Light, Green Light walking to a specials class; and while participating in songs that require shifting attention between the lyrics and hand motions in music class. to intentionally reflect aloud and offer examples about how they have felt and managed their emotions. This is a powerful strategy to use at school and home to work through friendship issues and build perseverance for learning new concepts. Trinity has a long history of focusing on the development of the whole child, including the underlying skills needed for academic and social-emotional growth. Now, we know more than ever about how the brain develops, and the research is clear about the importance of self-regulation for academic and social achievement. Our deep experience teaching preschool and elementaryaged children, our intentional practices, and the strong relationships we have with our families allow us to build a solid foundation for learning. Scaffolding Beginning at infancy, adults help children develop a critical sense of safety, security, and belonging by responding to their needs and attempts at communication. Response to needs also includes providing routines and structures that allow children ageappropriate ways to practice attending to and following directions, making plans, and following through on a plan. Scaffolding can be anything from routines for getting ready for bed at night to writing activities in class. At Trinity, scaffolded tasks provide teachers with opportunities to build students’ skills by offering feedback and sharing strategies for accomplishing goals. Allison Williams left a lasting legacy with the founding of Trinity School in 1951. Allison and his wife Jo’s vision of Trinity serves as an inspiration that should encourage each of us to follow in their footsteps and create our own legacy at Trinity. Make the gift of a lifetime Members of The Allison and Josephine Williams Legacy Society have included Trinity in their wills or estate plans. Their gifts provide financial support that is critical for the School’s future. Trinity relies on planned gifts to grow and flourish now and in years to come. Our physical campus, named professional development funds, and endowed scholarships all benefit from the generosity of The Allison and Josephine Williams Legacy Society members. Planned gifts continue our readiness for opportunities and challenges ahead and help Trinity remain a leading elementary-only institution. We are grateful for these thoughtful donors because their unique financial support ensures that the School will be prepared for the future and for future generations of Trinity students. Pre-K Teachers Claire Cagle, Tiki Norris, and Harvey Ross program Blue-Bots alongside Mike Flynn. young children that help teach counting, sequencing, estimation, directionality, and problem-solving. Students use the command keys on the back of the robots to program them to move forward and back and left to right. On September 24 and 25, Mike Flynn facilitated professional development sessions at Trinity School on Engaging Students in the Standards for Mathematical Practice through Robotics and Programming. Flynn is the director of Mathematics Leadership programs at Mount Holyoke College, where he runs the Master of Arts in Teaching Mathematics program and leads a wide variety of professional learning opportunities for teachers, teacherleaders, coaches, administrators, and staff-developers. This professional development opportunity was possible because of a three-year grant Trinity received from the Goizueta Foundation. “Mike brought such enthusiasm to our session and opened my mind to so many different ways that I can use the BlueBots in my classroom,” says Pre-K Lead Teacher Claire Cagle. “From counting and sequencing to problem solving and just having fun, the possibilities are truly endless!” “I really enjoyed how hands-on and engaging the professional development was,” says First–Fourth Grade Science Teacher Lauren Kane. “I was excited to learn about a new type of technology that has so much potential in a science classroom. There are numerous ways that I can see using the Blue-Bots to enhance learning across all grade levels.” Third Grade Lead Teacher Caroline Dwight says, “My main takeaway is how to make lessons more about inquiry and how to place the learning in the hands of the student.” “I’m excited that you can integrate BlueBots into any core concept to demonstrate understanding, and it’s an opportunity for formative assessment while the students are engaged in a different way,” says Director of Curriculum Marsha Harris. professional development that focuses on day-to-day teaching practices. Since Flynn’s professional development sessions and the introduction of the Blue-Bots, Trinity Teachers have used their creativity to design tasks and challenges that require the students to code, observe, and analyze the movements of the Blue-Bots in order to complete them. Our teachers are connecting the robot challenges to all areas of Trinity’s curriculum, from children’s literature and reading to gaming for word and sound identification to geometry and attribute identification in math. students programmed Blue-Bots to travel from the USA to France, to the United Kingdom, to Jamaica on a world map!” -Pre-K Lead Teacher April Patton “Using Blue-Bots in the classroom incorporates hands-on critical thinking techniques and has been very engaging and beneficial for my students. Use of the robots increases students’ spatial awareness as they use logical reasoning to work together to solve a problem.” -Second Grade Assistant Teacher Katherine Spits “We collaborated on an end-of-unit activity for Fourth Graders’ Space unit. After working together to program the Blue-Bots, Second Graders Graham, Elle, and Ajay excitedly wait to see if the robots make it to their desired destinations without running into each other. After sequencing Pete the Cat: I Love My White Shoes, Pre-K students Henry, Baker, Gianluca, and Roxanne used the Blue-Bots in a cooperative learning activity, in which they communicated ideas and waited to take turns. Fourth Graders in Brian Toth’s classroom program their Blue-Bots during their Mars Rover mission. in chairs to stretching out on the classroom rug. The benefits of flexible seating can be summed up in four main areas: community and collaboration, movement, choice, and comfort. When students share a space with others, they are more likely to strengthen social skills. Students have the opportunity to choose who they sit next to each time, which leads to sitting with new people. The ability to pair up with a new partner or small group for collaborative conversations is more easily achieved when they have the chance to sit in a variety of locations. I have witnessed new friendships blossom as a result of flexible seating. Movement is an important factor in why flexible seating is so successful. There is no question that children love to move and need to move often. From bouncing and twisting to leaning and kneeling, there are stationary options as well as several seats that allow for wiggles without distraction. This simple movement can help to increase oxygen flow to the brain and blood flow throughout the body and improve core strength. When students are unable to move, they can be distracted easily, and the movement keeps young minds more alert and focused. The opportunity to exercise some control over their environment empowers students and builds confidence. Making a decision about where they can work best invites them to think about what they need as learners. When they are involved in this process, their ability to selfmonitor improves. In our classroom, we encourage our students to find a good-fit spot. During the gradual rollout process, we discuss the importance of finding a seat that will help them be the best learner and away from any potential distractions. Students also have the opportunity to change their seat as needed. When students are uncomfortable, they tend to be more distracted and less productive. Flexible seating allows students to find a seat that works best for them. Comfort plays a role in their decision. For example, oftentimes a variety of our students choose to sit in the library with a clipboard and pillow to complete their math or writing. When students are comfortable, they tend to be calm, focused, and, most importantly, productive. After researching flexible seating and observing the immediate benefits, I have seen firsthand how our students are flourishing from this new model. I am always seeking the best ways to reach my students, empower them as learners, and deepen their educational experience. Flexible seating has enhanced this initiative in our class this year, and I look forward to watching our students continue to develop their curiosity, creativity, and confidence in their learning. First Grade Lead Teacher Julianne Schaaf â&#x20AC;&#x2DC;81 has a one-on-one conference with First Grader Sophie during read-to-self time. First Grader John enjoys his good-fit spot, where he builds reading stamina. Early Education Math Specialist Becky Holden and First Grade Lead Teacher Ali Avery react to First Grader Kweku leveling up in his learning. Leading learners to level up We want every learner in our care to be able to say, “I can make sense of tasks and persevere in solving them.” But what if they think they can’t? What if they are stuck? What if they feel lost, confused, or discouraged? Learning progressions provide a clear trajectory to guide student progress, questions, and aspirations. Developing learning progressions helps our teaching teams identify learning targets—what is essential to learn—and at least one pathway for students to reach or surpass this target. This method of vertically aligning curriculum offers a way to identify plateaus and gaps in the curriculum as well as the humanity of learning. Visually displaying learning progressions helps our learners grow their understanding, independence, and confidence. Much like Google maps, learning progressions orient students to their current location and provide ideas on next steps to guide them along the learning journey. For example, a learning progression on “I can make sense of tasks and persevere in solving them” looks like this: • Level 4: I can find a second or third solution and describe how the pathways to these solutions relate. • Level 3: I can make sense of tasks and persevere in solving them. • Level 2: I can ask questions to clarify the problem, and I can keep working when things aren’t going well and try again. • Level 1: I can show at least one attempt to investigate or solve the task. Learning progressions naturally convert to formative assessment opportunities. If students know where to go, can they show that they are on a path to getting there? If teachers find that students are off course, can they help them make course corrections before it is too late? Learning progressions offer students locator feedback (you are here) rather than judgmental feedback (you are this). This method of assessment offers actionable feedback based on data, and students are able to level up in their learning progression using this path of success. Ritchhart, Ron, et al. Making Thinking Visible: How to Promote Engagement, Understanding, and Independence for All Learners. San Francisco, CA: JosseyBass, 2011. Print. Rothstein, Dan, and Luz Santana. Make Just One Change: Teach Students to Ask Their Own Questions. Cambridge, MA: Harvard Education, 2011. Print. Continual growth of this critical fundraising effort allows the School to continually grow our programs, enhancing each student’s Trinity Experience every year. To make your gift, please visit trinityatl.org/give or contact Maggie Carr, Director of The Trinity Fund and Major Gifts, at 404-760-4407 or mcarr@trinityatl.org. Sixth Graders Pierce, Campbell, and Hutch operate the soundboard during a recording of TTV. room, and studio that boast stateof-the art lighting, sound equipment, teleprompters, and cameras. Then in 2017, with the advent of video streaming and the online video revolution, the segments and episodes have been formatted for sharing on the TTV YouTube channel. Under the direction of Trinity’s Production Studio Manager and P.E. Teacher Jedd Austin for the past 11 years, Trinity School Sixth Graders ride the waves of technological change and learn how to work in front of and behind the camera: directing, producing, reporting, leading interviews, operating lights, writing scripts, rehearsing, setting up microphones, running the teleprompter and sound boards, collaborating with others, and managing projects from inception to completion. “I see the Trinity TTV program as a culmination of the leadership skills that our Sixth Graders have been preparing for,” says Austin. “Each TTV team of students assigned to an episode shares in the responsibility of how their episode will turn out. They have to learn to collaborate with others that may not be in their normal circle of friends; accept roles on a production team; and utilize their writing, reading, and oral presentation skills.” From interviewing the Head of School to starring in fitness videos set on the Trinity Track, Sixth Graders enjoy participating in a multi-media program that is a unique aspect of the Leadership Class experience. Filming takes places all over Trinity’s campus and students from other grade levels are regularly asked to participate. Production Studio Manager Jedd Austin films Sixth Graders Randall, Milan, Ethan, Amanda, and Trevor as they perform a Fitness for Fun segment. Regular TTV segments and features include: What Is That?, Word of the Week, Fitness For Fun, ANFSCR (And Now For Something Completely Random), EnviroTips, Book Babble, Question Time, Be Better, and Courage Corner. You can view the last few years of TTV broadcasts and individual features by visiting the Trinity TV YouTube Channel at trinityatl.org/ttv. You can also follow all the TTV fun on Instagram and Twitter @trinity_tv. Celebrating its 38th year, Spotlight on Art had a very successful succession of art events, from the Pop-Up Gallery at Neiman Marcus in the fall to the annual Gala and Auction in February. Ever year, this premier art series in the Southeast showcases new, original works by established and emerging artists. Led by new Director of Spotlight on Art and Special Events Leisy Ruddock and managed by a group of more than 100 volunteers, Spotlight welcomed thousands of attendees, from avid collectors to casual buyers, to its events throughout the 2018â&#x20AC;&#x201C;19 school year. Pop-Up Gallery at Neiman Marcus The season opened with the Spotlight on Art Pop-Up Gallery at Neiman Marcus. Held from September 29–November 3, 2018, the event included thoughtfully curated artwork from 25 select artists that served as a preview of the much-anticipated Artists Market held at Trinity School. All work was available for purchase. An Evening at Neiman Marcus On November 1, a group of 75 Trinity parents enjoyed An Evening at Neiman Marcus, an intimate Spotlight on Art event in partnership with sponsor Neiman Marcus. Held at Neiman’s at Lenox Square, this sold-out affair featured a fall fashion trends presentation by Public Relations Manager of Neiman Marcus Rebecca Brodnan, Founder and Editor of Born on Fifth Emily Hertz, and renowned Jewelry Designer Mignonne Gavigan; an exclusive runway show; and shopping, light bites, and bubbly. Pop-Up Shop at Trinity School Spotlight on Art opened a PopUp Shop during conferences on November 5 and 6. This event featured works by several artists exhibiting at the Artists Market. In addition to unique art, the Pop-Up Shop included Trinitybranded items for purchase. Artists Market A truly unique experience, this year’s Artists Market was once again housed in the Allison Williams Activity Center (AWAC), which was transformed into a beautiful 6,000-square-foot gallery space. The work of more than 350 artists—from contemporary to realism, whimsical to jewelry—was featured during this event that ran from January 28–February 2. An ever-changing inventory brought attendees from around the Southeast back for multiple shopping trips, and an average of 1,000 pieces sold daily. During the Artists Market, Spotlight hosted the Opening Night Celebration on January 28 and Cocktails and Canvases: Meet the Artists on February 1. Open to the public and free of charge, these signature evening events allowed attendees to meet the Market artists while enjoying beverages and hors d’oeuvres and browsing one-of-a-kind art. Gala and Auction To cap off the Spotlight season, the School hosted its annual Gala and Auction for the Trinity community. Hundreds of parents, faculty, staff, and special guests came together on February 23 for an evening of fun and philanthropy! Held at the Atlanta History Center, the event included a delicious seated dinner catered by Dennis Dean, cocktails, a silent auction, a fast-paced live auction by Ahlers & Ogletree Auction Gallery, dancing, and music by Tron Jackson. It was an evening to remember! 2019 Nonprofit Beneficiary: Furkids Continuing Spotlight’s service-learning tradition, the Trinity Sixth Grade Leadership Class selected Furkids as this year’s nonprofit beneficiary to receive proceeds from Spotlight on Art. Furkids, Georgia’s largest no-kill animal shelter and rescue organization, received not only a monetary gift from Spotlight on Art, but also a gift of community service hours from our Sixth Graders. Children’s Art Project This year’s Children’s Art Project (CAP) utilized the photography skills of Trinity’s Associate Communications Manager Paul Ward. He took photos of students using their bodies to form the individual letters of words that represent their Trinity Experiences. The resulting words were displayed on nine grade-level specific canvases that were part of the Gala’s silent auction. Emily Bronstein ’16 used her Bat Mitzvah to help girls in southern Africa, Emily Grace Fuller ’15 recognized that she could use her connections to help the homeless, and Reyn Owen ’16 turned four concussions into an opportunity to help others. Young alums have passion for service work Trinity School’s mission has always included developing young learners to become compassionate members of the School and greater community. We believe that serving our community begins with our youngest students and evolves as they grow and mature. In the case of three of our young alums, all of whom are in their mid-teens, they prove that age is not a factor when it comes to serving others and making a difference in the world! Emily Bronstein ’16 is currently in Ninth Grade in Park City, Utah, and is most proud of the way that she has been able to turn a passion of hers into something bigger that directly impacts girls her age on the other side of the globe. She is looking forward to returning to Africa to spend more time with the Seraphine girls this year. To learn more about The Seraphine Project, visit https://theseraphineproject.com/. Emily Grace Fuller ’15 is in Tenth Grade at Phillips Exeter Academy, a boarding school in New Hampshire. Because her experience with the teen residents at Covenant House was such a positive and personal journey, she didn’t mind putting in the long hours required to be successful in her fundraising. This newfound passion has led Fuller to aim toward a career that is service based. She would like to one day run a nonprofit, possibly for homeless teenagers or families. Reyn Owen ’16 is a Ninth Grader at The Westminster Schools, who enjoys being outdoors. He is most proud that he is able to help young people overcome obstacles that may have otherwise prevented them from experiencing the amazing life lessons and benefits that come from sports and exercise. To learn more about his Play It Forward Foundations, visit www.playitforwardfoundations.com. organizations serving at-risk youth with the needed equipment in urban and rural communities around Atlanta. I set up equipment drives in local schools, churches, and businesses to collect the equipment and established relationships with community organizations focused on helping these young people. Now, as a registered 501(c)(3), I am able to give tax deductions to anyone who makes a donation to my foundation, Play It Forward Foundations (PIFF). Currently, I partner with Boys and Girls Club of Metro Atlanta, Play It Again Sports, Bearings Bike Shop, Youth Football Association, and others. I have also partnered with numerous business leaders and athletic professionals around the city. In addition, I have created a foundation at the Shepherd Center for any money PIFF raises through individual and corporate donations. PIFF helps fund recreational rehab for adolescents who have sustained life-altering brain or spine injuries that isnâ&#x20AC;&#x2122;t otherwise covered by insurance. Recreational rehab includes things like trips to restaurants, sporting activities, and field trips as adolescents first begin to experience what life will be like after their injuries. 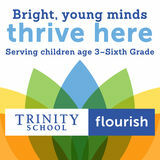 Did Trinity School help to foster your path of service? Bronstein: It definitely instilled a sense of caring for others. Trinity also gave me the confidence to believe in myself as well as the organizational skills to turn an idea into a full-fledged program. Fuller: Trinity definitely fostered my love of service. We often had grade-wide service projects, whether it was visiting a nursing home, helping out at another school in need, or even clearing paths and planting trees. It was one particular project at Trinity that really affected me though. It was a drive to collect toys and supplies for a homeless shelter daycare in downtown Atlanta, and I had the chance to be a part of the group that delivered the items and toured the facility. Seeing families in that situation really stuck with me and I sought out other opportunities to volunteer. I also chose to center my Trinity Sixth Grade Capstone Project on homelessness and specifically one nonprofit that served the youngest affected by it. I held a drive to collect supplies for Our House, a shelter in Atlanta for families with newborns. I also spent some time at the shelter with the young children the program serves. Owen: Yes, giving toys during Trinity toy drives began my path of service. Charity and giving seemed to be a constant part of Trinity over the years. Share some of the highlights associated with your time serving others. Bronstein: One of the biggest highlights of working on The Seraphine Project is definitely all that I have learned from the girls in Africa. When we visited in November 2017, I had the opportunity to meet several of the girls, and one of my favorite experiences, hands down, was the time spent with them. the work and building this company. I had to fill out and submit all the legal documents to form the corporation. I also am responsible for all of the IRS filings and accounting. I went to a local SunTrust branch and set up a small business account. I have regular meetings with grown-ups and professionals to discuss Play It Forward Foundations and partnerships and sponsorship opportunities. I have also begun writing grant applications for additional funding opportunities. Another highlight was that I was selected as one of 48 nonprofits companies nationally to have a professional website designed and built for me through the 48in48 project. I worked with a team from IBM iX in Manhattan and a team from London to build my site. What advice would you give Trinity’s students who may be interested in service work or starting their own nonproﬁt? Bronstein: First, find something that you are passionate about. Then contact organizations that focus on that cause to better understand how they are making an impact and to get ideas about how to potentially help. From there, think about key priorities, like how to build a network and what it takes to raise awareness and tell your story. It’s also important to have a specific goal you are working toward and, if you achieve it, understand what impact you will have. Fuller: My advice is to research opportunities or organizations that need volunteers in your area. There are many that do appreciate children as volunteers. Even taking the time to work on a one-time or one-day event can give you a good idea of where you’d like to focus going forward and any amount of time you have to offer is typically very much appreciated. You don’t have to start with a big commitment, doing something here or there until you find a special connection is fine. Whether it is at your local food pantry or a dog shelter, take a few hours out of a weekend and just participate. Find something you enjoy working on and if you can’t find a specific shelter or organization of interest, don’t be afraid to create your own project that centers on your most passionate cause. Owen: The most important part of starting a nonprofit is finding something that both inspires you and serves a necessary purpose. Find something you are really passionate about because that passion is going to be your motivation, inspiration, and reward a lot of the time. Starting a nonprofit is a lot of work and not something you can just quit whenever you want. There are a lot of people who count on you. I would also advise that you focus on not only identifying a problem, but also coming up with a realistic and effective solution to that problem. Alumni Seventh Grade Reunion In October, our youngest alums took time out of their busy Seventh Grade schedules to put their elementary hats back on. The Class of 2018 was invited back to Trinity School for their first official reunion. The group played on the playground, in the Gaga pit, and on the track; enjoyed a pizza dinner; and caught up with their former classmates. Events Seventh and Eighth Grade Bowling Party Strike! Trinity alums in Seventh and Eighth Grade gathered at Midtown Bowl on a December afternoon for pizza, bowling, and fun with old friends. A good time was had by all! Matthew Coggins ’06 and his guest confer with Head of School Joe Marshall as they work on a STEAM project in the Idea Lab. Class Notes In Memoriam Owen Green ’03 passed away on February 16, 2019. An Atlanta native, he lived in Aspen, Colorado, and was promoted to group sales specialist for Snowmass Tourism in 2018. Athletic from a young age, Green became an All-American lacrosse player and team captain during his time at The Lovett School. He went on to play Division I lacrosse on athletic and academic scholarships at Jacksonville University in Florida, where he earned a bachelor’s degree in marketing and management. In his free time, he coached the Aspen High School lacrosse team and enjoyed fly fishing, mountaineering, and snowboarding. Green is survived by his parents, Travis and Patricia; his brothers, Eamonn ’99 and Kyle; his paternal grandmother, Janet; and his maternal grandparents, James and Eileen O’Grady. Clay Prickett ’96 and his wife, Ali, welcomed their first child, Griffin Denver Prickett, on September 27, 2018. Louis Battey ’99 and his wife, Keller, welcomed their first child, Louis “Ford” LeGarde Battey IV, on January 12, 2019, at Piedmont Hospital in Atlanta. Ford was 6 pounds, 7.5 ounces. Margaux Black Gray ’00 was recently inducted into The Westminster Breithaupt Athletic Hall of Fame, in recognition of her fast pitch softball excellence. She also pitched for Harvard University, where she was a National Fastpitch Coaches Association Scholar-Athlete and named to the All-Ivy League second team. Gray is currently finishing her pediatric residency at Stanford Medical School. In addition, she and her husband, Tommy, welcomed their first child, Ella James Gray, on November 6, 2018. 4 Visit www.trinityatl.org/alumni to submit Class Notes and update your contact information. Reeves Henritze ’01 married Robert McCall, of Winston Salem, North Carolina, on December 8, 2018, in Boca Grande, Florida, surrounded by her family and friends, including several Trinity alums: Porter Hamilton ’19, Morgan Henritze Hamilton ’91, Hunter Henritze ’95, Porter Henritze ’98, Terry Smith Henritze ’67, Tyler Henritze ’93, and Parker Henritze Morse ’99. Dessie Woodall Stowe ’02 is running a cheerleading camp held on The Marist School’s campus. This is her second year running the camp for girls ages 5-12 years. They do cheers, dances, and arts and crafts. Isabelle Babb ’08 was recruited to the U.S. Naval Academy as a rower on the women’s crew team and graduated in May 2018 with a degree in Systems Engineering. She was then commissioned into the U. S. Navy as a Naval Aviator. Stationed at the Naval Air Station Pensacola and training to become a pilot, Babb has top security clearance. player in program history with five punts of 65 or more yards and is just the fourth player in Penn State history with two 70-plus yard punts in his career. Hadyn Jolly ’11, a sophomore at the University of Portland in Oregon, spent last summer as a camp counselor at Kanakuk, a Christian summer camp in Branson, Missouri. She will return for another season this summer. In February, Donovan Mitchell ’13 and his 200m freestyle relay team took first place in the Georgia High School Association State Meet with an All-American time for the race. Eliza Normark ’13, Peter Bernot ’14, Kate Gryboski ’13, and Mary Claire Anderson ’16 also swam and placed in several events on the state championship team. Oliver Babb ’12 graduated from The Westminster Schools in May 2018. In summer 2017, he was selected as one of 40 men on the Junior National Rowing Team and competed in the World Rowing Championship in Trakai, Lithuania. Babb was recruited by Columbia University as a rower on the men’s crew team and is enjoying his freshman year in New York City. When he is not studying or rowing, Babb is composing electronic music and playing his guitars. A senior at Atlanta Girls’ School, Elinor ‘Ellie’ Munson ’13 has traveled to Honduras for the past five years to help doctors with medical exams. She has also volunteered with the Georgia Epilepsy Foundation, Leukemia and Lymphoma Society, Children’s Healthcare of Atlanta Explorer Program, and Decatur Youth Council. Cole Walker ’13 was named a semifinalist at the regional History Bee & Bowl held at Jackson High School in Jackson, Georgia. His finish in the History Bee qualifies Walker for the National History Bee & Bowl, which will be held in Washington, DC, in late April. Zelle Westfall ’13 is on the short list of finalists for the Sony World Photography Awards in the youth category. Westfall was also a finalist in The New York Times teen photo contest. Please see one of her entries displayed on the next page. Aidan Mahoney ’16 was selected to perform in the Georgia Music Educators Association (GMEA) All-State Senior Men’s Chorus in February 2019. He was previously selected to perform in the GMEA All-State Middle School Mixed Chorus in both 2017 and 2018. After two years at Woodward Academy, Mahoney is now at The Galloway School, where he runs cross-country in addition to participating in chorus. He recently returned from a two-week service trip to Puerto Rico. Davis John Hollis ’17 recently finished a successful season as captain of the Woodward Academy Middle School swim team. Ella Shutze ’15 recently authored a book of poetry and prose titled Lightning Struck Me Twice. The book relates to her deep work of self-inquiry in Woodward Academy’s Ethical Dilemmas and Decision Making courses. Visit www.trinityatl.org/alumni to submit Class Notes and update your contact information. Reilly Cullen ’17 and Will Overstreet ’17 are teaming up once again on the big stage! They appeared together as Don José (Overstreet) and Escamillo (Cullen) in Trinity’s 2017 production of Carmen, and have just been cast as Donkey (Overstreet) and Shrek (Cullen) in Whitefield Academy’s middle school rendition of Shrek the Musical. Performances will be May 3 and 4. On the next page, they are pictured with fellow Carmen cast members after their 2017 performance at Trinity. Left to right: Heather Frisch ’17, Will Overstreet ’17, Katherine O’Brien ’17, and Reilly Cullen ’17. 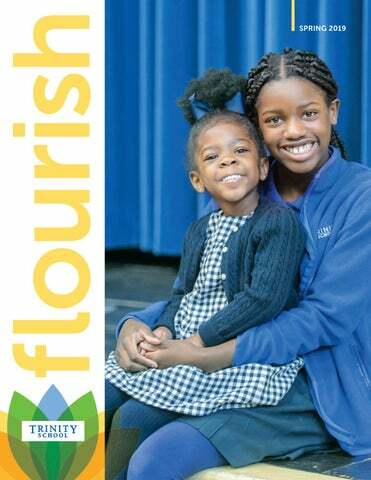 Enjoy the spring 2019 edition of Trinity School's bi-annual magazine, Flourish.